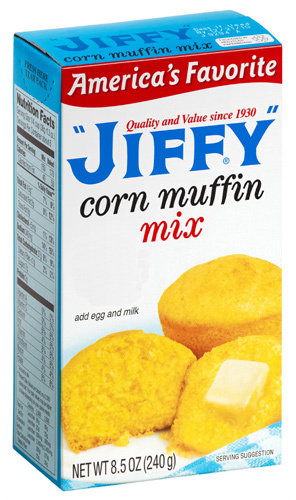 ‘Howdy’ Holmes shares his family recipe — ‘JIFFY’ Corn Muffin Mix — with millions each year. Family recipes will be served all over the country (and internationally by many ex-pats) at Thanksgiving celebrations this week. Families who produce recipe staples alternate between relaxing as a family and ramping up productivity at the family firm at this time of year. Howdy Holmes, CEO of the third-generation Chelsea Milling Company, has had the company’s signature product, “JIFFY” Corn Muffin Mix, at every Thanksgiving of his life. After all, it’s his grandmother’s recipe that the company began mass-producing in 1930. “Thanksgiving is centered around eating, of course, so there was always plenty of ‘JIFFY’ mix to go around,” Holmes says. The holiday is different now in the Holmes family — it’s smaller, with branches of his family spread out and busy, he says. There is still plenty of mix to go around today, of course. In the “baking season,” from Labor Day to the end of January, Chelsea Milling produces 1.3 million boxes of the corn muffin mix daily, Holmes says. Each year the company uses 19 million tons of cornmeal. To keep up with demand, 45 to 75 temporary employees are added in production. All the company’s employees are “family” to Holmes. In that family spirit, the company has instituted a tasty policy. Employees are allowed to take home four boxes of mix — a week. “Some comply and some fudge it a little,” Holmes says with a laugh. “I should probably put a camera in that area. We don’t have a security guard or anything. What those employees do with the mix when they get home is not limited to making corn muffins. There are other recipes on the box, and many have been developed and circulated over the last 80 years. The recipe is known by many names (this author has always called it “corn pudding” and also considers “corn soufflé” to be acceptable), but the official title is “spoon bread casserole,” and the recipe can be found at jiffymix.com. Holmes takes it in stride and never gets insulted.